Comedy Central is helping kick off the network upfronts season with its own presentation, the first in its 25-year history. Following yesterday’s Snapchat-focused announcements, which include what amounts to a new web series for Nikki Glaser, the cable network has rolled out the rest of its 2016-17 development slate. 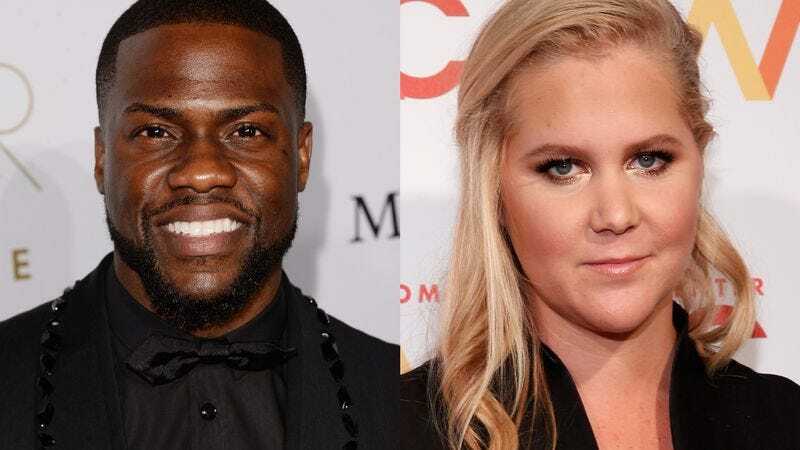 Unsurprisingly, comedy is still the first order of business, with projects from Amy Schumer, Kevin Hart, and Chris Hardwick that will spotlight up-and-coming performers, while a new series will make an “unprecedented commitment” to comedy documentaries. Schumer, whose sketch-comedy series returns April 21, has two projects in the works—the first is a pilot starring Rachel Feinstein, that will see the Red Oaks actress go undercover to “perform social experiments that tackle a different issue or theme each week.” And their Inside Amy Schumer colleague Kyle Dunnigan just sold a script about a show set at a superhero academy, which Schumer will produce. Hart, who’s hosting the MTV Movie Awards next month, will soon give Tyler Perry some competition for greatest number of self-titled projects. Comedy Central has picked up two series from Hart: The first is Kevin Hart Presents: Hart Of The City (he managed to get his name in the title twice), a travel series that will take the Central Intelligence star to different U.S. cities to check out their comedy scenes. Hart also has a stand-up series in development that will showcase rising comedy stars. Although a Gambit movie isn’t in the cards yet, Channing Tatum has scored a pickup as well: He’s producing and starring in the animated series Germany, which is set at the University Of Berlin. While Tatum takes a break from mastering a Cajun accent to learn a German one, The Daily Show’s Jessica Williams will be starring in and producing her own narrative pilot, of which details are currently scarce. Comedy Central has also ordered a number of stand-up specials, including ones from Saturday Night Live’s Pete Davidson, The Daily Show’s Jordan Klepper, and Black-ish writer Deon Cole. And Jeff Ross will get to roast the police as well as host a battle of roasters, while Moshe Kasher will get Problematic in a half-hour pilot. There are even more synopses of new series available at Deadline.